Hope students (and their faculty leader Boyd Wilson) wearing saris and dhotis continue to draw attention during their May Term in India. This photo appear in a Tamil newspaper in Chennai, according to Professor Wilson. "We were walking from Saint Thomas Cathedral to the train station. You can tell we are all tired . . . it is very hot in Chennai and near the end of a very long day." 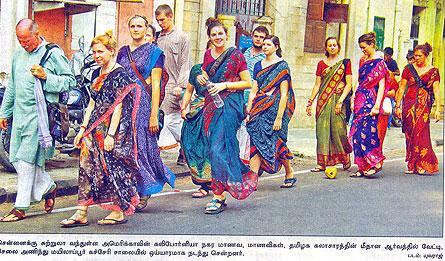 The photo captain reads: "American tourists walk along road near Kapaleshwar Temple in Mylapore wearing traditional Indian clothes." In the picture, from left to right: Boyd Wilson, Kyla Koboski, Hannah Gielsczyk, Michelle Irvin, Dan Schriemer, Sarah Fodor (partially hidden), Maddie Ferguson, James Teaford, Paige Douglas, Kimberly Collins, Elizabeth Higginbotham, Kelsey Herbert, and Grace Cheeley. Earlier in the month, students attending the May Term in India were also featured two other newspapers. This photo was on Chowpatty Beach Mumbai (Bombay), a festive place on the weekend. One of the things the students love doing is eating corn-on-the-cob cooked over burning coals. The caption in Hindi reads (roughly) foreign girls enjoying corn on Chowpatty Beach. "We continue to be an attraction because it is so rare to see any young women in their 20s wearing saris in India, but ESPECIALLY white women! !," said Professor Boyd Wilson. The girls in the picture (from left to right) are: Kimberly Collins, Grace Cheeley, Kelsey Herbert, and Paige Douglas. The students also were pictured in The Times of India, Bangalore edition. The students pictured are Maddie Ferguson, Michelle Irvin and Sarah Fodor. A major grant to Hope College from the Howard Hughes Medical Institute (HHMI) will help the college develop new ways to educate students in the natural and applied sciences through its nationally acclaimed model of teaching through participation in original research. The annual Hope College golf outing, the “Bob DeYoung Hope Classic,” will be held on Monday, June 18, at Ravines Golf Club in Saugatuck.